One of the many thing I like about historical fashions is color. My everyday wardrobe is full of black (with just some little lighter stuff for summertime), as it's just so convenient, but on period wear it's refreshing to indulge in pretty colors. I decorated the hat intended for the pet en l'air (aka "The Barbie dress") with green mainly because the silk ribbon I wanted was only available in green, but once I got to wear it I realized that the combination of pink and green was actually quite delicious. 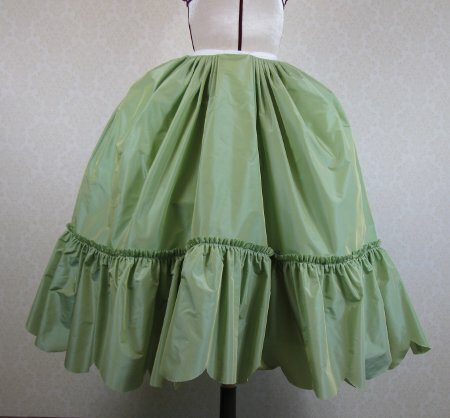 Now I was inspired to make a new light green petticoat for the summer season. For the material I chose inexpensive and durable polyester taffeta. To get more pretty fluffiness I added a wide ruffle on the hem. 6 meters of neat hemming by hand sounded too laborous, so I decided to try pinked edges for once. Apart from faster they would be also prettier and way more period correct. I pencilled a scallpoed edge with the help of a bowl and cut it with pinking scissors. The nice thing about polyester is that it melts, so I tried to melt it a bit with a lighter flame to keep it from raveling. It was slow work too, as the edge melted too much very easily, and the result was not very good, but perhaps it will hold the edge together a bit. I also noticed later that the scallop proportions were quite large and not very delicate, but I had made it in a hurry without much planning or testing - bad habit I seem to have developed. I finished the skirt hem hidden under the ruffle with machine. 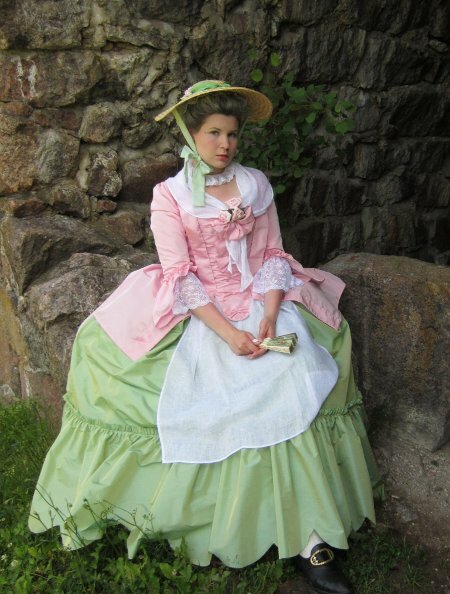 To protect the pinked edge from raveling I made the petticoat quite scandalously short, as it was designed for outdoor wear and would have to be washed all the time if it was trailing the ground or even close to it. If one wants to nitpick, the frivolous length and the ruffle date the petticoat a bit later than the pet en l'air, but I decided not to care. I attached the ruffle on small box pleats. 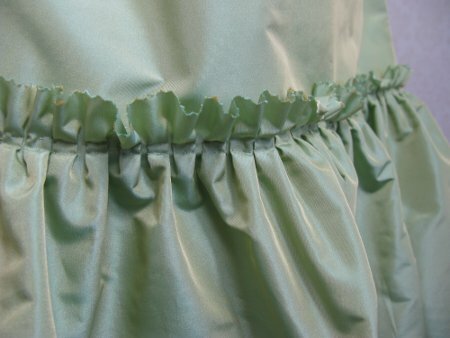 Pinning the finished round ruffle on the skirt in regular pleats took forever, and on the afterthought it might have been more handy to leave the other side seam open, prepare a generous amount of the ruffle and just pin it freehand. As I was already halfway I did not care to begin anew, but this was useful to realize for my next grand pleating project, 1770's polonaise. Finishing the waist went mainly on old well-trodden paths, save one detail I decided try. 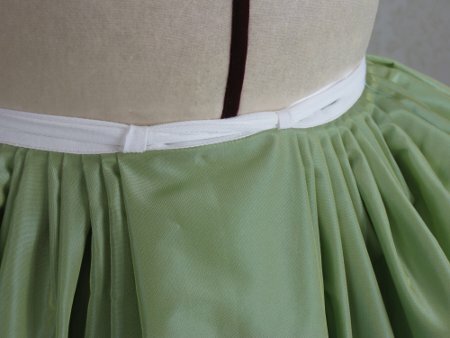 I added small loops on the front through which the ends of the waist tapes of the skirt back can be threaded. Thus they keep the front of the skirt securely on it's place and stop it from sliding downwards which usually happens very easily. This trick may not be period correct, but I have found it so useful that I plan to make it in all my future petticoats. The super cute petticoat gave the pet en l'air a fresh new look like I had hoped, and for some reason the outfit always makes people smile - and that can never be a bad thing, right? << Back to the Project page The first picture is taken by Ida Perälä.